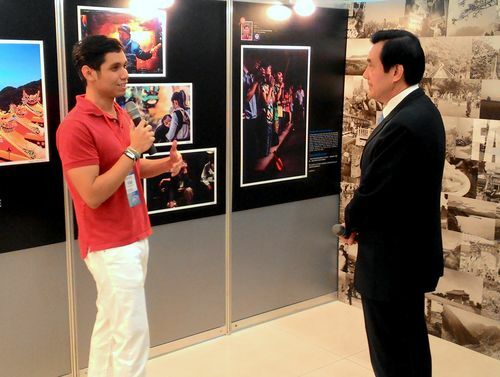 President Ma Ying-jeou (right) speaks with a foreign student. Taipei, May 8 (CNA) President Ma Ying-jeou (馬英九) expressed hope Friday that the number of foreign and Chinese students in Taiwan will surpass the 100,000 mark next year, noting the growing number of foreign students in Taiwan over the past seven years. After taking office in May 2008, Ma said, he felt the need to make Taiwan a hub for higher education in the Asia-Pacific region, which would help Taiwanese students to develop a global perspective through interaction with international students without having to go abroad. Over the past few years, the number of students from China, Macau, Hong Kong and various foreign countries has been on the increase, Ma said during a speech at a farewell party for Taiwan Fellowships and Scholarships students, who will soon return to their home countries after finishing their studies in Taiwan. According to statistics compiled by the Ministry of Education, there were 30,509 foreign and Chinese students (including those from Hong Kong and Macau) studying in Taiwan in 2007, a number that had risen to 92,685 in 2014. Ma expressed hope that the number will hit 110,000 next year, when he will step down after finishing his second term. He also said he expects Taiwan to become the world's center for Mandarin Chinese education which teaches both traditional Chinese characters (used in Taiwan and Hong Kong) and simplified Chinese (used in China). During his speech, the president also said he was pleased to learn that many people have become high-ranking government officials or have secured promising jobs in their home countries after studying in Taiwan. Citing as an example a visit he made to the Solomon Islands in 2010, Ma said that the Pacific island country's agriculture minister at the time was a graduate of National Pingtung University of Science and Technology in southern Taiwan. "Today is the end of your studies, but it's also the starting point of a new relationship between you and the Republic of China," Ma said, adding his hope that the students will stay in contact with each other and visit Taiwan in the future. "Taiwan is always your second home, and I know some of you have seen it as your home," he said. Established in 2004, the Taiwan Fellowships and Scholarships program is a government initiative aimed at promoting research, educational links and friendship between Taiwan and the international community. The program comprises three categories: fellowships for research, Mandarin enrichment scholarships, and scholarships for degrees. About 1,200 grants are offered each year for undergraduate and postgraduate students, as well as researchers from around the world to study or conduct advanced research in Taiwan.